IIT Gandhinagar invites applications to M.Tech. programmes in Biological Engineering, Chemical Engineering, Civil Engineering, Computer Science and Engineering, Earth System Science, Electrical Engineering, Mechanical Engineering and Materials Science & Engineering for the year 2018-2019. The M.Tech. curriculum at IIT Gandhinagar has been designed to be highly creative with a focus on interdisciplinary skills and high quality thesis work. 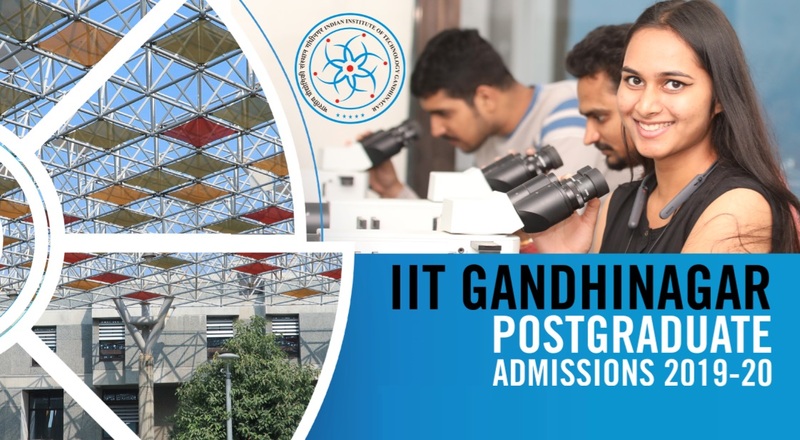 IIT Gandhinagar also offers the option of a post-graduate diploma in engineering (PGDIIT), which is a one year programme designed to be an intensive course-work based programme with no thesis requirements. The M.Tech. programme at IITGN places strong emphasis on both course work and research dissertation/thesis, while the PGDIIT programme only places emphasis on course work. The thesis is compulsory for the award of an M.Tech. degree. It is expected that the thesis will result in high quality scholarly publications and national and international conference presentations. A thesis is not required for the PGDIIT degree. Total minimum 80 credits in course work and thesis. - Departmental Core and Elective Courses - balance of the required credits. Grades of thesis units are not counted for the calculation of SPI/CPI. Candidates should satisfactorily complete the thesis work for the award of an M.Tech degree and this may require more than 48 research credits. The minimum CPI for graduation is 6.0. The minimum CPI for continuing in the programme at any point is 5.5. That is, if at any stage, the student has a CPI less than 5.5, the programme will be terminated. In case the CPI of a student falls below 6.0 or the student accumulates three or more Us towards thesis grades at any point of time, the fellowship provided by the Institute will be stopped permanently. The student may seek financial support from projects or other Institute activities through individual effort. In exceptional cases, continuation of the fellowship may be approved by the Director on recommendation of Dean, Academic Affairs. Full-time MTech student will have maximum of three years to obtain the degree. The coursework, research, and thesis requirements for part-time M.Tech. students will be identical to the requirements for regular M.Tech. programme. However, part-time M.Tech. students may take longer than 4 semesters to finish the programme and will not be eligible for financial support. A cumulative experience of at least two years is necessary for admission to the part-time M.Tech. programme. Disciplines: Biological Engineering, Chemical Engineering, Civil Engineering, Computer Science and Engineering, Earth System Science, Electrical Engineering, Materials Science and Engineering, and Mechanical Engineering. Total minimum 32-48 credits in course work (actual minimum credits determined by individual disciplines). Institute encourages M.Tech. students to present their research work at national and international conferences, and provides travel scholarships of upto Rs. 60000/- to such students. "Category wise reservations on overall available seats will be followed as per Government of India norms." Admission is generally offered on the basis of a written test and interview. The Institute will invite a limited number of candidates for a written test and interview based on the academic records and/or GATE score. The Institute reserves the right to use its own judgment while determining the candidate's level of competency based on the available information. The final selection will be based on all of above, viz., academic records, GATE score, written test and interview. The Institute may also exercise the option of offering admission to a few outstanding candidates based on academic record and/or GATE, without calling them for written test and interview. The written test is generally based on the topics related to general aptitude (logical reasoning, analytical and numerical ability, etc. ), engineering mathematics, and basic courses in various disciplines up to 3rd year of undergraduate programme. The candidates who do not qualify in the written test need not appear for interview. The reserved category candidates will be given due relaxation in cutoff marks as per the norms. The candidates called for the Test and Interview will be reimbursed any amount exceeding Rs.750/- for to and fro single second-sleeper class railway fare by the shortest route from their place of residence to the Institute /venue of the Test / Interview. For example, in case of total railway fare of Rs.1400/- the candidate will be reimbursed Rs.650/-. It is required to produce evidence (railway ticket) in support of the claim. The portal for 2019-20 (Sem I) M.Tech. admission is closed.